This poached pear and goat cheese salad is made with mixed greens tossed with a pear shallot vinaigrette, topped with poached pears and herbed goat cheese. Sometimes I think I could add goat cheese to anything and it would make it better. Goat cheese is one of those ingredients, at least for me, that is an essential. Of course, the older I get, the more items I add to my list of “essential” ingredients. It used to be that chocolate was the only one on the list. Heat the wine, sugar, cinnamon and orange peel in a large saucepan, stir occasionally. Meanwhile peel the pears, cut them in half and core them; add them to the wine mix once it boils. Cook until the pears are tender but still slightly firm, about 15 minutes. Remove from the heat and let the pears cool down. To prepare the vinaigrette combine all of the ingredients in a food processor or blender and mix well. Taste and adjust salt/vinegar/oil if needed. Toss the salad greens with the vinaigrette and arrange on a plate. 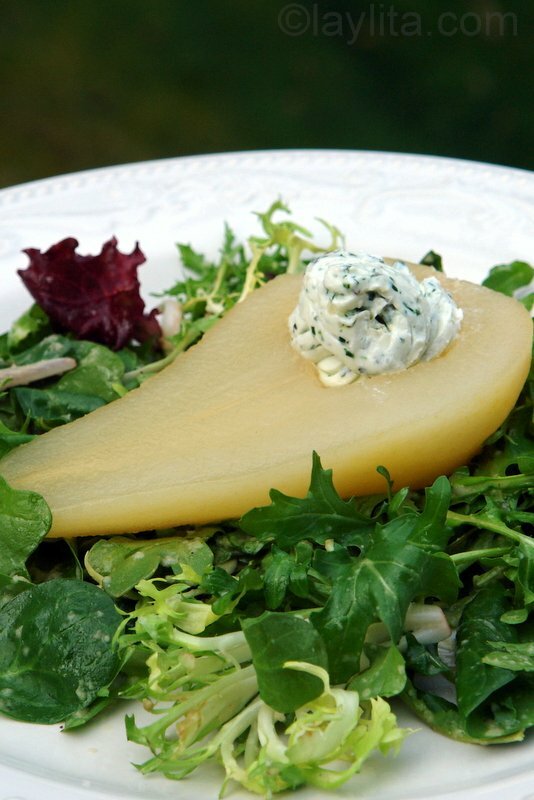 Place each ½ pear on top of the salad greens or alternatively you can slice the pear halves and arrange the slices on top of the mixed greens. Put the herbed goat cheese in a pastry bag and add a squirt either in the indention of the pear half, or on the sides. I love salads, pears and goat cheese, but this is the first time I’ve tasted them combined together and it’s a good, addictive good. This recipe is adapted from one of my favorite (and very creative) cookbooks – Fired Up- by Jeff Blank, who is the chef and owner of a Hudson’s on the Bend in Austin, TX. The original recipe uses sherry vinegar, but I used pear vinegar instead. I’ve made it before with the sherry vinegar and it’s also very good, but mainly I was looking for an excuse to try the new pear vinegar I bought (feel free to use sherry vinegar or your favorite vinegar if you can’t find pear vinegar). I also used mixed greens instead of arugula. I love arugula but I felt that between the spiciness of the herbed goat cheese and the shallots in the vinaigrette, I needed something a little more subtle. The quantities in this recipe are for 6 people. Sounds delicious! I once did a salad with pears and blue cheese and hated it … goat cheese would be so much better! I might also add pecans or candied pecans to the salad. Yummmmm! Me encanta la combinación que has hecho!, felicitaciones por tu blog, es una fiesta para los sentidos! This reminds me of a little salad my mother used to make when I was a kid. Her’s was much simpler. She used a bed of lettuce, half of a pear with salad dressing in the hole from the core, and a slice of cheese on top. This version is beautiful, and I’m sure it’s delicious! Thanks, Noble Pig. I used just regular riesling (a local Washington one). This is beautiful! I would like to make this for my next supper club. Did you use a late harvest riesling or gewurz or just regular? My mouth is seriously watering! I love goat cheese, too, and I think the pear/goat cheese contrast would be wonderful. All your photos are just beautiful!